See guest artists Ross Richmond and Randy Walker in a live, narrated demonstration in the Amphitheater Hot Shop on September 25 and 26. Ross Richmond and Randy Walker have known each other since 1997. They are participating in an Instructor Collaborative Residency at The Studio this fall and hope to work on body of work that would combine their strengths in form, color, and using the boundaries of the material. While Walker focuses on a natural theme, Richmond often works with the figure. During their residency they, plan to create objects that combine the two, bringing realistic figures together with colors and objects found in nature. Ross Richmond discovered glass in 1991 during his time at the Cleveland Institute of Art, where he received a BFA in glass, with a minor in metals. He is considered one of the top glass sculptors in the field today, and has worked with (and for) some of the greatest glass and non-glass artists, including William Morris, Jane Rosen, Preston Singletary, KeKe Cribbs, and Dale Chihuly. 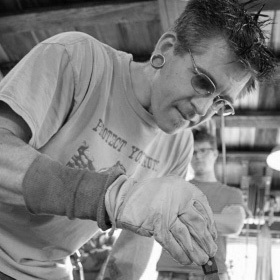 After graduating from Oklahoma State University, Randy Walker found his way to Pilchuck Glass School in 1989, where he took classes, and has worked every summer as a faculty member or craftsman. In 1992, he began working for artist William Morris, where he would later meet Ross Richmond, with whom he’ll be completing an Instructor Collaborative Residency at The Studio in 2016.